Canada might have been drawn into arguably the toughest group for the 2019 FIBA World Cup, but Rowan Barrett isn't complaining. With a berth in the 2020 Tokyo Olympics on the line, Canada's men's basketball team will face No. 6-ranked Lithuania, No. 11 Australia and 37th-ranked Senegal in Group H of the tournament, Aug. 31 to Sept. 15 in China. 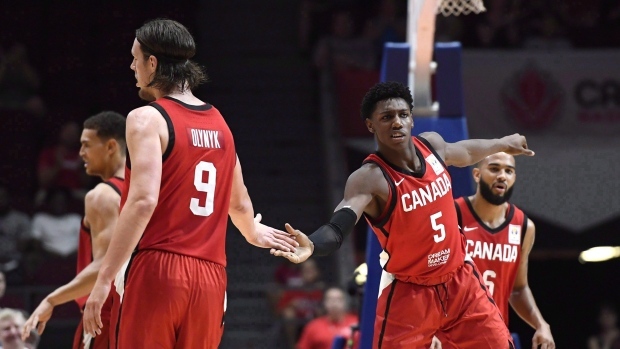 "I don't think that as hard as we have worked to get to the World Cup that we will now complain about the draw," said Barrett, Canada Basketball's general manager of the men's program. The top two teams in each group advance, and carry their records to the next round. The bottom two teams are bumped to the consolation side of the draw. "Each one of (Canada's opponents) was first in their group so they've clearly been performing well," Barrett said. "I think it's good that (the draw) was this far out, it gives us the opportunity to look within our depth pool as we form our team to counteract the strengths of the other teams. If Canada advances to the championship side of the 32-country draw, it will face the best two in Group G of France, Germany, Dominican Republic and Jordan. The top two teams from each group then advance to the quarter-finals. Canada hasn't had a team in the World Cup since a disastrous 22nd-place finish in 2010 in Turkey, where the team went 0-5. There's plenty on the line this time around for a Canadian team on the rise. The top seven clubs in China will punch their tickets to the Olympics, where Canada's men's squad hasn't played since 2000 in Sydney. The Olympic field features just 12 teams, and so Japan as host takes one of the five remaining spots, with the final four awarded at a last-chance qualifying event in 2020. The Canadians will open against Australia. Canada hasn't faced the Aussies in world championship action since 1998 — an 88-71 loss — and is 3-2 all-time against them. They'll play Lithuania, a team they've faced only once in the world championships — a 70-68 loss in 2010. The Canadians will wrap up the preliminary round versus Senegal, against whom they're 2-0 — most recently a 70-57 win in 1998. Canada's preliminary-round games are in Dongguan, an industrial city on China's south coast. Barrett's next step is to hire a head coach, and he expects to have that person in place by the end of March. Canada, which went 10-2 in qualifying, used three head coaches for its dozen games: Jay Triano, Roy Rana, and Gord Herbert. Canada Basketball has cast a wide net in its search, Barrett said. "I think that it was important to look internally first," he said. "Nobody is going to have more familiarity with our players than our coaches, and we've had three head coaches in the windows coach us. So you start by looking there and have each share their vision and their plan. "At the same time it's important with our athletes, and the sacrifice our athletes have shown, and the growth and development in their games, they're working hard and they want every chance to win that they can have. So it's incumbent upon us that we're evaluating our whole program, whether it's our analytics department, our medical staff, our therapy team, all of it, as well as our coaching to ensure we're putting our best foot forward to lead the group." The Canadian team will gather for camp in Toronto in early August.